Quickfire Review: The Skeleton Twins (2014) – Hooray For Movies!! Despite the two lead actors sitting very much in the top 1% of the last decade’s greatest SNL cast members, anyone wanting to see The Skeleton Twins in the hope of getting a farcical caricature comedy will be sorely disappointed. Instead they will be met with the kind of performances that set apart comedians who can act funny and comedians who can genuinely act. Craig Johnson’s follow up to the little seen Duplass Brothers produced True Adolescents meets the definition of bittersweet. Skeleton Twins starts dark with Milo Dean (Hader) deciding to end his life. While on the surface this seems directly linked to a break up from his boyfriend, when his estranged twin sister Maggie’s (Wiig) own simultaneous suicide attempt is interrupted by the news of Milo’s it is clear that there are deeper emotional currents running through their narratives. Indeed when Milo returns to his childhood town with Maggie to recover, both are forced to confront the skeleton’s in their closets, old and new. Produced by Mark and Jay Duplass, The Skeleton Twins has the indie darling’s dramedic fingerprints all over it. 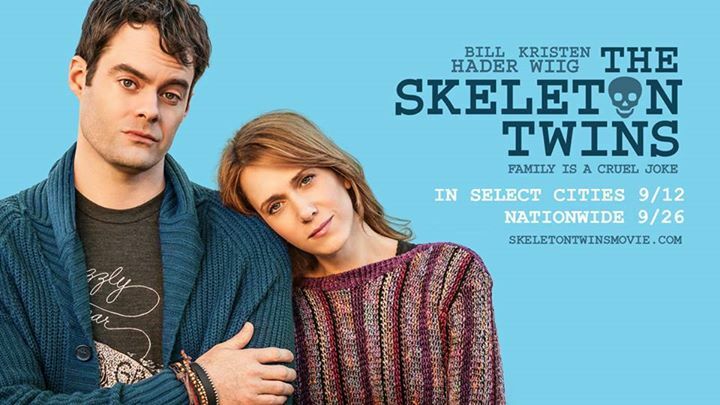 Like many of their own works, notably Your Sister’s Sister and Jeff Who Lives At Home, The Skeleton Twins always walks the line between laughing and crying without ever feeling unnecessarily saccharine, like people at a wake remembering funny stories about the one they’ve lost. And like the Duplass back catalogue, Johnson’s direction relies heavily on his two lead performers to have a natural chemistry and simultaneously demonstrate comedy and deep melancholy. While Hader and Wiig both put in career broadening performances, it is their deep and intrinsic chemistry from years of riffing on SNL that gives the film it’s heart. There is never a moment you don’t believe they are siblings with the kind of emotional connection that only twins can understand. Conclusion: The Skeleton Twins is to Hader and Wiig what Eternal Sunshine was to Jim Carrey or Dead Poets was to Robin Williams. Bittersweet and brimming with natural chemistry it is a joy to watch the SNL alumni emerge from their comedic chrysalis and demonstrate their emotional range. Good review. Wiig and Hader are impressive here and it has me look forward to what’s next with their careers.